Alternatively if you wish to pay by direct bank transfer please contact me using the contact email link below. Make a beautiful A5 book using the Japanese 4 hole binding technique & specialist bookmaking materials. 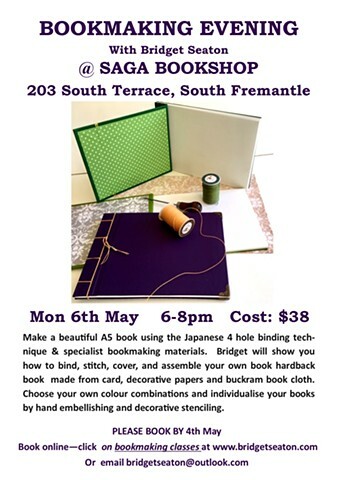 Bridget will show you how to bind, stitch, cover, and assemble your own book hardback book made from card, decorative papers and buckram book cloth. Choose your own colour combinations and individualise your books by hand embellishing and decorative stencilling. No experience needed and absolutely everything is provided.